There is one absolute pre-condition for ending the Israel-Palestine conflict by diplomacy and negotiations on the basis, as it would have to be, of justice for the Palestinians and peace with security for all. 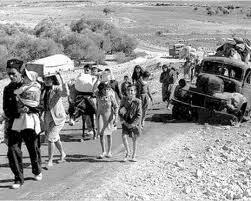 It is that the Jews acknowledge (1) that a terrible wrong was done to the Palestinians by Zionism in the name of all Jews everywhere – the terrible wrong being the ethnic cleansing of Palestine, a process that continues to this day slowly and by stealth on the occupied West Bank; and (2) that this wrong must be addressed. THE question arising is this: Why are most Jews unable and/or unwilling to acknowledge the wrong done to the Palestinians? My Gentile answer begins with a short, one-sentence statement that begs another question. Most Jews do not want to know about Zionism’s crimes. The question is – why don’t they want to know? A longer version of the question is something like this. Why are the minds of most Jews open only to Zionism’s version of the history of the making and sustaining of the conflict, a version which asserts for propaganda purposes that Israel is the victim and not the aggressor and oppressor it actually is, and closed to the truth including the fact that Israel was created mainly by Zionism terrorism and ethnic cleansing? In my analysis the key to understanding why most Jewish minds are closed to the truth about Zionism’s crimes is in a single word – fear. Of what? That there will one day be another great turning against the Jews. and that when it comes they will need Israel as their refuge of last resort. In this way of thinking the Zionist state is their insurance policy. So, they believe, they must not do or say anything that could assist Israel’s enemies and put their insurance policy at risk. And that means, among other things, not challenging Zionism’s version of history. Given the fact that Jews were persecuted on and off down the centuries, there is a case for saying that in the immediate aftermath of the Nazi holocaust a Jewish perception of the need for Israel as an insurance policy was not irrational. But there is also a very strong case for saying that because of the Nazi holocaust the monster of anti-Semitism would have gone back to sleep, probably remained asleep, and might even have died in its sleep if Zionism had not been allowed by the major powers to have its way. (More on this in a moment). In other words, there is a case for saying that after the Nazi holocaust, and because of it, the perception of the need for Israel as an insurance policy became irrational with the passing of the years. The evidence which supports this case is the completeness of the acceptance by the overwhelming majority of non-Jewish Europeans and North Americans of their fellow Jewish citizens. European and North American Jews had never had it so good. Anti-Semitism still existed to some degree in the shadows but throughout the second half of the 20th century there was never the danger that it would emerge from the shadows and go on the rampage again anywhere in the Western world. Why then did most European and North American Jews cling to the view that they still needed or might need Israel as a refuge of last resort? The short answer is that Zionism conditioned them to believe that the world has always hated Jews and always will, and that’s why, Zionism asserted, it must do whatever is necessary, without question, to preserve the “Jewish state” as a refuge of last resort for all Jews. One of many truths about Zionism is that it needs anti-Semitism in order to justify its policies and actions. (In recent weeks I have been monitoring the comments on a number of web sites and I have come to the conclusion that Zionist assets are most probably the originators of much of the anti-Semitic poison that is spewed out). The problem today as I understand it is that what became in my opinion (as stated above) an irrational fear in many Jewish minds is in the process of being transformed into a rational fear. That’s quite a complicated thought and I’ll now do my best to explain what I mean. What we witnessing in the world today, provoked by Israel’s policies and actions in defiance of international law and UN Security Council resolutions, is a rising tide of anti-Israelism or anti-Zionism (meaning opposition to Zionism’s colonial enterprise). Contrary to what Zionism is seeking to make the Jews of the world believe, criticism of Israel’s policies and actions is not by definition a manifestation of anti-Semitism, but… There is a very real danger that anti-Israelism or anti-Zionism could be transformed into anti-Semitism. The implication seems to me to be this. Throughout most if not all of the second half of the 20th century there was an opportunity for European and North American Jews to let reason be their guide and conclude that they were not going to need Israel as a refuge of last resort. If they had come to that conclusion, they would have been free to acknowledge the wrong done to the Palestinians by Zionism; and that acknowledgement could have opened the door to a real peace process. But not now. The days when that could have happened are gone. The more Israel becomes isolated and perceived as a pariah state, and the more successful Zionism is at convincing most Jews of the world that what is happening is an indicator that anti-Semitism will be going on the rampage again, the more likely it is that the need of most Jews to keep their minds closed to the truth of history will be reinforced. Is there nothing that can be done to cause the closed minds of most Jews to be opened, at least to the point of acknowledging the wrong done to the Palestinians by Zionism? If the answer is “No” I think the future is predictable – a final Zionist ethnic cleansing of Palestine followed by Holocaust II, shorthand for another great turning against the Jews. In that event what I call the greatest paradox in all of human history would be clear to all. The Zionist state was created to save the Jews from anti-Semitism but became, as many Jews prior to the Nazi holocaust feared would be the case, the agency that provoked anti-Semitism. (And that’s why I insisted on Zionism: The Real Enemy of the Jews being the title of my book, even though it is about much, much more than that title suggests). In the past I have touched on something that could be done to assist the Jews of the world, European and American Jews especially, to open their closed minds. I called for a New Covenant, not between the Jews and their God but between the Jews and the Gentiles. For their part of the deal, and to assist Jews to see that they didn’t need Israel as a refuge of last resort, the Gentiles would commit to slaying the monster of anti-Semitism. An undertaking to let the monster die in its sleep would not be good enough, I said. There would have to be evidence that a stake was being driven into its heart. For their part of the deal the Jews of the world would commit to making common cause with those of all faiths and none who were calling and campaigning for peace based on justice for the Palestinians with security for all. When I look at that idea in writing it seems trite. But perhaps it’s better than no idea. The problem many Jews have is a product of how they have been conditioned by their peers in the diaspora. This is something that has been going on over a long time. Peer Pressure and Denial: A Them against Us thing. I remember once a UK Rabbi said something to the effect of "...the Holocaust was brought about by...something within the Jewish people...". Many people who are conditioned to be abused go on to become abused, abusers themselves or both. Do we see any signs of an awakening amongst many Jews or is it being suppressed by the Zionist supporting media? There are Anti-Zionist Jewish groups but they may as well not exist when one listens to mainstream media. Or are they too receiving Zionism's "Treatment"? Then there are the religious Jews who claim that "the deed for our land is the Torah." This land belongs to the Jews as it was given by god and all others are not only not welcome but they can be expelled and killed and this is happening today. The there is the unconditional support of the USA and the zionist lobby there composed mainly of evangelical christians. There are many reasons that the Zionist governments and media don't want the general public to know the truth - which is that Zionist and Nazi leaders share the same bed for years. One has to read Rabbi Wolf Gunther Plaut's 1990 book, "The Man Who Would Be Messiah" - or Hannah Arendt’s 1963 bppk, "Eichmann in Jerusalem" to find out the truth. Two of your premises are wrong. The first is that most Jews don't acknowledge the ethnic cleansing of Palestinians between 1947 and 1949 from what became Israel. Most in fact do acknowledge it. Those that are Zionists will usually justify it as somehow necessary or will quickly point out an equal number of Sephardi and Mizrachi Jews expelled from their own countries at around the same time. Second, I take issue with your statement that this ethnic cleansing was done "in the name of all Jews everywhere." If your meaning is that the Zionists did these things claiming to represent all Jews, then fine. But if your indication is that these actions were a priori approved of by all Jews everywhere, then you're wrong.